Madras-based magazine editor and historian Eraly has an obvious fondness for the glory days of India’s Mughal period, an era that lasted less than two centuries but led to such astonishing monuments as the Taj Mahal and even a few moments of peace among the loosely knit country’s religious factions. The first of the Mughal rulers, a descendant of both Timur the Lame and Genghis Khan, had the imposing birth name of Zahiruddin Muhammad (Muhammad, defender of the faith) but was known as Babur, “Tiger.” His vast army swept across much of northern India by way of Persia and Afghanistan, establishing an Indian throne in 1526; his subsequent war on a Rajput-Afghan alliance turned on a fine, almost legendary moment in which the hard-drinking, opium-smoking king renounced such things, returned to Islam, and built a fine pillar of the severed heads of his enemies. His son Humayun succeeded Babur and impressed those around him with a gentleness so thorough that he wept while doing in members of his own family; alas, poor Humayun on his robe while praying and cracked his head open. Next was Akbar, who embellished the Mughal throne with a religion meant to transcend Islam and Hinduism and exalt the Mughals in the bargain; opium and wine ended his rule. And so on. 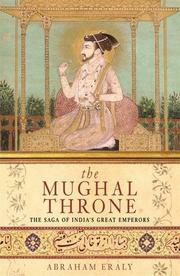 While Eraly admits to being something of a moral historian, he is quick to note that the flawed, all-too-human, all-too-hedonistic Mughals actually got some things done, including the political unification of much of the subcontinent and the establishment of an Islamic state that was generally secular until the time of the last Mughal emperor, whose orthodoxy helped bring about the end of the dynasty. Highly accessible history, full of illuminating asides on such things as the world’s most famous diamond, the perils of eating too much saffron, and the cupidity of medieval mullahs.